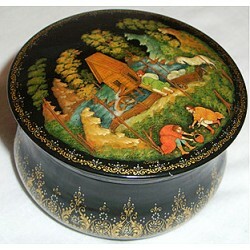 This attractive round-shaped box has been painted by Olga Kolygina from the village of Palekh. The work is called "Winter", and shows peasants feeding birds. The scene is drawn in brown, blue and red tones of tempera paints. Gold and aluminum are used to outline and limn extra details into the scene. 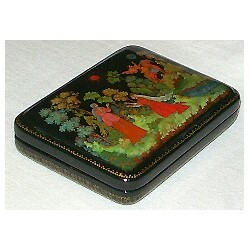 This small oval box is a creation of Olga Kolygina from the village of Palekh. 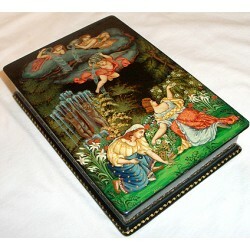 The work is called “Rusalka” or “Mermaid”. This fascinating piece was created by the talented Marina Denisenko of Palekh. It shows the main characters of the tale "The Little Mermaid" written by Hans Christian Andersen. Here we can see the moment when the Little Mermaid meets the Prince and falls in love with him. Yevgenia Shatokhina of Palekh is the artist who painted this beautiful. 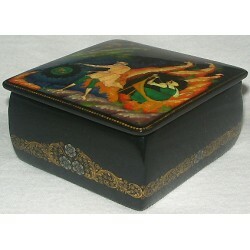 Yevgenia (or Zhenya for short, as she signs the piece) has a beautiful style that is classic Palekh, but at the same time exhibits a unique flair.The painting is based on the popular story of, "The Sleeping Beauty"
Yevgenia (Zhenya) Shatokhina is the author of this traditional Palekh box. 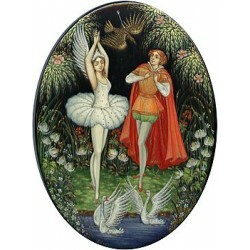 It shows a scene from the Russian fairy-tale "Silver Hoof". This pieceful composition was created with true passion for subject by Palekh artists, Sergey and Maria Gurilyev. This husband and wife artistic team is well known for their dedication to detailed imagery.Here the artists have depicted a scene of a family relaxing on a bank of pond. Yevgenia (Zhenya) Shatokhina is the artist who painted this romantic scene. 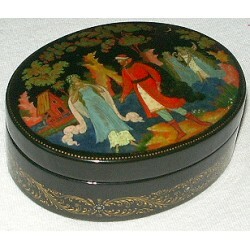 This small Palekh box has been drawn by Nina Bogachova whose favorite themes to depict are folklore and genre scenes. 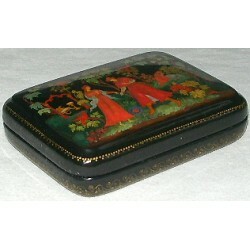 Collectors love her work for its mood, and for its dynamic and flexible appearance. 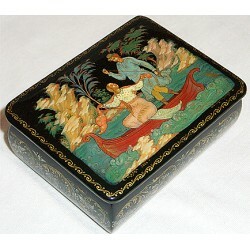 This traditional Palekh box is a creation of Yevgenia (Zhenya) Shatokhina. 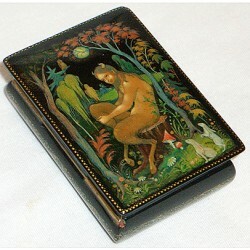 It depicts a scene from the Russian tale, "Emelya and the Magic Pike". Here we can see Emelya who approaches the tsar's palace riding a stove. 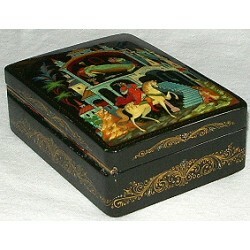 This is a passionate example of exquisite Russian artistry. 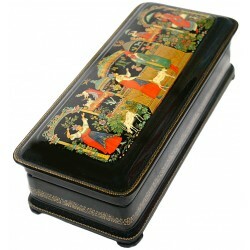 The colors caress the theme depicted, the inner contours and accompanying decoration are well executed compliments. Marina Denisenko is the experienced artist that developed this charming composition. Her work is always a fine ambassador of the village of Palekh. 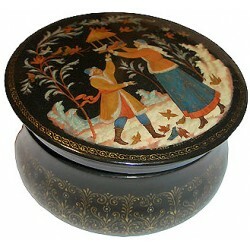 This attractive round box has been painted by Larisa Mazurina from the village of Palekh. Mazurina was born in 1974 in the village of Palekh, Ivanovo Region where she resides at present. In 1994 the artist finished the Palekh Art School. Her teachers were V.V. Buldakov and T.I. Belousova. Her favorite themes to depict are fairy-tales and landscapes. 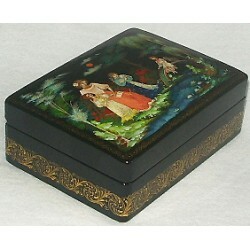 Yevgenia Shatokhina of Palekh is the artist who painted this beautiful box. It shows the Forest Spirit sitting on the stump, and thinking about something. 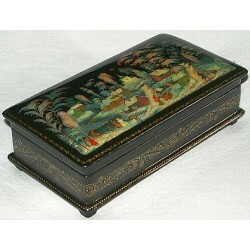 Yevgenia Shatokhina of Palekh is the artist who painted this beautiful box. Yevgenia (or "Zhenya" for short, as she signs the piece)has a beautiful style that is classic Palekh, but at the same time exhibits a unique flair. Larisa Mazurina of Palekh has created this composition displaying two peasant woman filling their pails with water at the well. 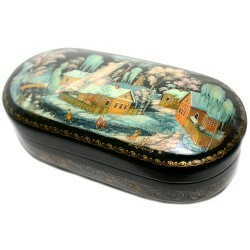 The scene is thoroughly detailed with gold and aluminum paint. 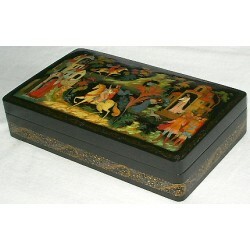 Yevgenia Shatokhina of Palekh is the artist who painted this beautiful box. Here she depicts villagers enjoying the simple pleasures of winter. Yevgenia (or "Zhenya" for short, as she signs the piece) has a beautiful style that is classic Palekh, but at the same time exhibits a unique flair. 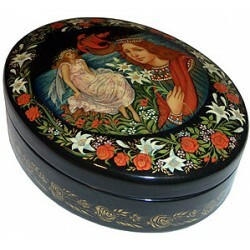 This oval box has been created by Bokova Irina from the village of Palekh. 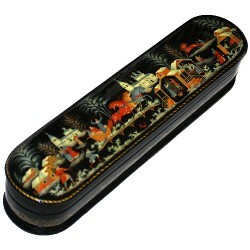 It features the traditional theme of a Russian winter troika. The troika rushes along the village street passing by peasants and their houses. 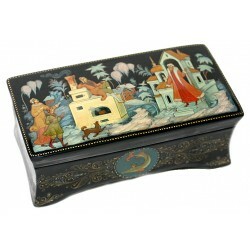 This box was created by Olga Tsyganova from the village of Palekh. 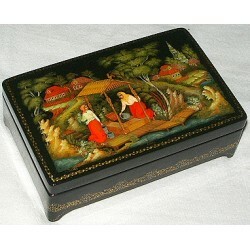 It features the fair, and certainly the merchants with their goods and the buyers. The main heroine of the composition is the peasant woman who came to the fair to sell her goat.